Dental care is crucial for your pet's overall health as well as good mouth health. Some of this care needs to happen at home, with regular tooth brushing, and some of it needs to happen at the veterinary clinic, with professional evaluation and cleaning done under anesthesia. It can be tricky to keep your dog or cat's mouth healthy because some pets don't like to have their mouths messed with, and it can be difficult to remember to check their mouths and brush their teeth. 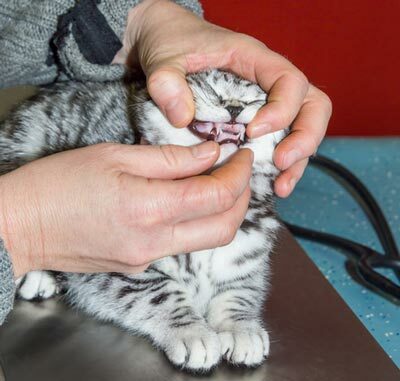 Good home dental care for pets includes looking at and monitoring the health of the teeth and gums routinely, performing regular tooth brushing at home, and setting up and keeping routine veterinary appointments. Of these, tooth brushing can be the trickiest to manage, especially if your pet is not used to having it done. The ideal situation is to start training your cat or dog to tolerate tooth brushing when they are young, but you can still get your pet used to the procedure even at an older age. Go slowly, and don't risk being bitten if your pet is not cooperating. Get your supplies together, including a toothbrush (dog and cat versions available) and some pet-safe toothpaste. Have your pet sit on a surface that puts their mouth at an easy-to-reach level for you. Stand on one side of your pet. Place some toothpaste on the toothbrush, and use your non-dominant hand to lift your pet's top lip. Use your dominant hand to carefully rub toothpaste all over all outside surfaces of your pet's teeth on that side. Switch sides, and repeat the process. Don't use human toothpaste on your dog or cat. They often contain fluoride and other substances like xylitol, which can be toxic to dogs and cats if they are swallowed. Instead, choose an enzymatic toothpaste that is formulated for pets. You can also ask the staff at your veterinary office to demonstrate proper tooth brushing technique for you. That's all there is to it. 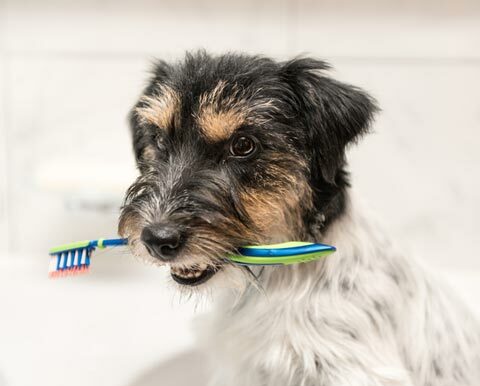 You don't need to rinse your dog's teeth off, as there isn't anything dangerous for them to swallow as long as you are using a toothpaste labeled for pets. In fact, the enzymatic nature of most pet toothpastes means that leaving them on the teeth allows them to work for a period of time afterward by breaking down the sugars left on the teeth from food. All cats and dogs need professional dental cleanings periodically. How often your pet needs this depends on his individual circumstances, and your veterinarian is best suited to help you determine that. Professional dental care includes full anesthesia for examination and cleaning of your pet's teeth at routine intervals. Ultrasonic scaling can be done, and plaque and tartar can be removed from the entire surface of each tooth, including under the gum line. All teeth can also be examined and checked for cavities, breaks, or other disease. X-rays can be done on the teeth to determine if there are any non-visible disease processes occurring. Veterinary dental specialists are available to do more complicated procedures like fillings, crowns, and root canals. Over 75% of dogs and cats have significant dental disease by the time they are three years old. Don't wait to implement a good dental health care plan for your cat or dog.